Fig. 4-16. Meridian Cross Section of the Earth Showing the Horizon Spheroid and the Horizon Bane. * Nadir hi re means toward the Earth's center. from the Earth's center, where R is the distance from the Earth's center to point A . 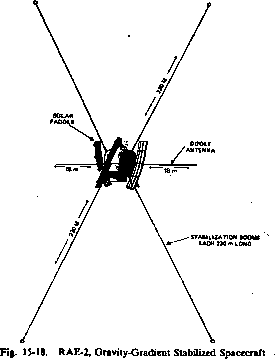 (the subobserver or subsatellite point). R is given by. 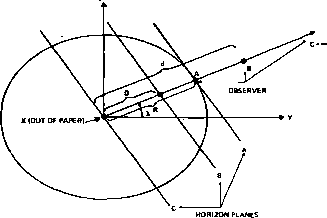 The horizon plane will approach the center of the Earth as the observer approaches infinity. Note that the nadir line passes through the center of the horizon ellipse. Figure 4-18 shows an example of the shape of the Earth as seen by an observer at 45-deg geocentric latitude and a distance of 200 km above the Earth's surface. To make the oblateness effect noticeable, a flattening factor 100 times larger than the true value was used. Table 4-3 compares the angular radius of the Earth for spheroidal and spherical Earth models. Table 4-3. 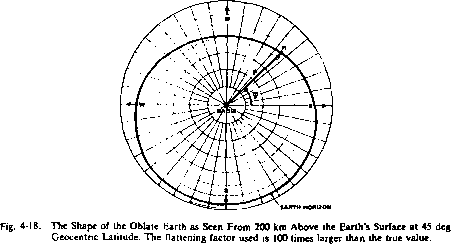 Angular Radius of the Earth From the Spheroidal Model at an Altitude of 200 km and Geocentric Latitude of 45 deg. Equation (4-24) and the following parameters were used: 0 = 6,378.14 km,/=>0.00335281, d=a + 200 km. The angular radius of a spherical Earth of radius a is p0 = 75.8353 deg.